V2 E-cigarettes have over a million happy customers already and the number will just keep on growing especially when the awareness of people about e-cigarettes would grow. So far, according to Alexa, V2 e-cigarette is the number one website since 2011 with the niche on e-cigarettes. Electronic cigarettes are starting to grow in trend and it’s expected that they will continue to be more popular especially when e-cigarettes would already be regulated. For those who want to continue getting the nicotine they’re craving for but minus all the harmful chemicals associated with tobacco, electronic cigarettes would be their best bet. Unlike nicotine patch, choosing e-cigarettes would still give you the same satisfaction like you’re actually smoking real cigarettes. Although it’s electronic but you can puff it like a real cigarette and the LED light would light up like the tip of a real cigarette and the smoke you’d be breathing in is not actually smoke but vapor. When you breathe it out it doesn’t have the bad smell that is normally associated with cigarettes. You have an option between the manual or automatic e-cigarette. 5 strengths of nicotine are available. One of the e-cigarettes that is very easy on the budget at a price of only $34.95 for their entry starter kits. V2 doesn’t offer discount bulk-packages on their E-Liquids and therefore, to try them all will be quite expensive. They offer 3 brand choices which can be confusing for new customers.. The first thing you should notice when visiting V2 is the upper left of their website. You will notice what I’ve highlighted for you on the left, there’s actually 3 brands and choices to choose from before you even get started. In this review, we hope to help you figure out which brand is right for you and then we will review each brand’s options below. V2 Cigs – This is the brand that most people choose. Ultimately, this brand is how the company got their start, it offers the cheapest introductory pricing, has the most options including accessories, disposables and more. 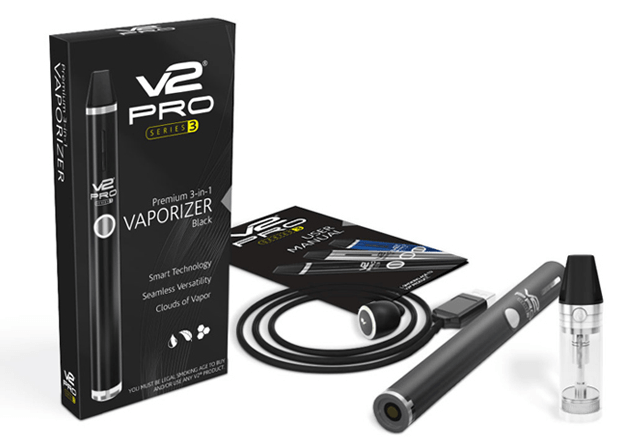 V2 Pro – This vaporizer kit is quite impressive because it acts as an e-liquid, loose leaf and wax vaporizer! That’s right, one e-cig does all three with various purposeful cartridges that this ecig will detect and smartly respond to the type of product you want to use. Be sure to check out the video and review below for the V2 Pro. Vapor Couture – A brand for the ladies. These ecigs are designed to be fashionable for women including fashionable accessories and look that is sure to please women who want to make a statement with their ecig. There are currently 10 starter kits to choose from with V2. Below, we highlight these options and what the differences are. 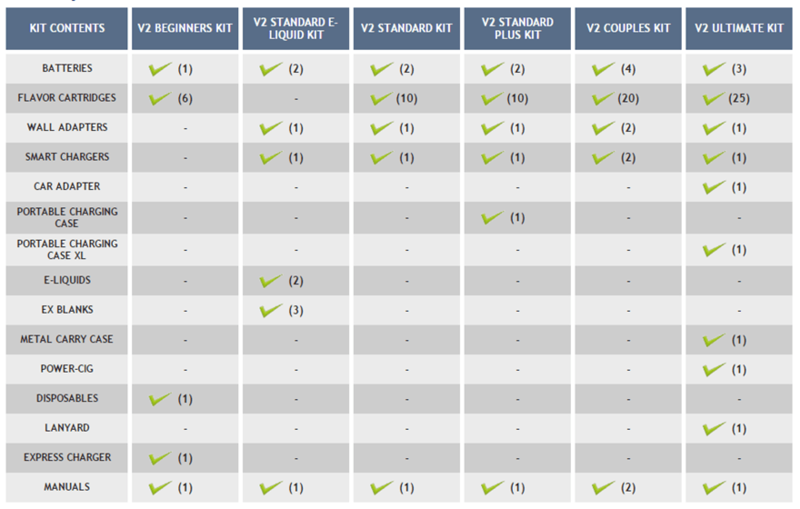 We also include a comparison chart for the top 6 choices that is provided by V2’s website. V2 Beginner’s Kit – $34.95 – This is the cheapest package available. It provides you with a V2 standard white automatic battery, 1 V2 Disposable, 6 V2 cartridges (choose between V2 Red or V2 Menthol) and an express charger. You will be forced to order the strength of 1.8% nicotine. V2 Standard Kit – $59.95 – This kit includes 2 batteries, 10 flavor cartridges, a wall adapter, and a smart charger. When ordering, you can select 2 5-pack flavor cartridges with 12 flavor options and 5 strengths from 2.4% to 0% nicotine. During your order, you can choose between 5 battery colors, 3 lengths and 2 switch types. V2 Standard Plus Kit – $99.95 – The same as the standard kit above but it also comes with a portable charging case. V2 Couples Kit – $114.95 – Basically you will get 2 standard kits as described above. V2 Ultimate Kit – $149.95 – This package includes the ultimate in gadgets and a big value. It offers 3 batteries, 25 flavor cartridges, 1 wall adapter, 1 smart charger, 1 car adapter, 1 portable XL charging case, 1 metal carry case, 1 power-cig, and 1 lanyard. V2 Standard E-Liquid Kit – $79.95 – We believe this is the most popular option because it is the cheapest ecig solution that offers e-liquids. You’ll get 2 batteries, 1 wall adapter, 1 smart charger, 2 e-liquids, and 3 EX blank cartridges (these are CLEAR). You will have the choice between 12 flavors of e-liquids in 5 nicotine strengths from 2.4% to 0%, 5 battery colors, 3 battery sizes and your choice of manual or auto. The EX series is fully compatible with the V2 Cigs products but it offers an enhancement to the electronic cigarette technology. As they explain it, you’ll get 100% more puffs out of the cartridges, you’ll have 100% visibility to your remaining e-liquids and a leak-proof design. There are no differences to what you will receive as far as comparing the EX to the standard above with exception to the enhancements of the cartridges and 5 choices of battery design shown above. V2 Cigs standard come in 3 sizes of batteries and 1 size for the EX series. Shorty – $14.95 – 190 mAh, 100 mm length and 160+ puffs. Standard – $19.95 – 250 mAh, 110 mm length and 200+ puffs. Long – $22.95 – 360 mAh, 140 mm length and 300+ puffs. V2 Cigs EX Brushed Steel batteries come in one size. $29.95 – 280 mAh, 135 mm and 300+ puffs. Definitely watch the video by V2 that explains and shows this newer ecig technology in action. This is a breakthrough technology that allows you to vaporize e-liquids, oils / wax and loose leaf products. The length of this ecig is 5.63 in, weighs 1.91 oz, has a 0.59 in diameter with a battery capacity of 650 mAh. Vaporizer Colors – Black, Silver or Blue. Your options include purchasing E-Liquids, a wall adapter, a car adapter and an additional e-liquid cartridge are available during your order. 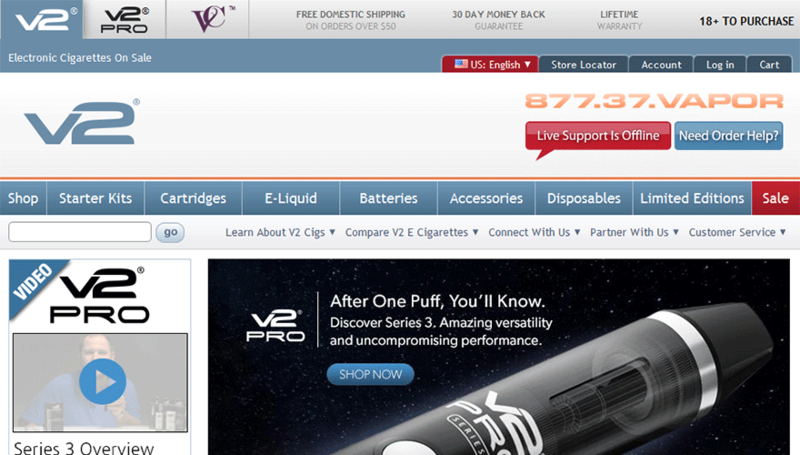 Note: V2 Standard E-Liquids are compatible with the V2 Pro e-cig. V2 offers 12 flavors under 3 categories: the rich tobacco flavors, cool menthol flavors, and specialty flavors. Grape, Cherry, Chocolate, Coffee, Vanilla and V2 Cola. Definitely check out their cartridge page for available packages you can purchase. They have specialty, menthol and tobacco flavor packs available and also look for the V2 12-flavor sampler which gives you a chance to try all flavors to see which is best for you for $18.95. All of the flavors that you see in the above cartridge flavor review are also available in E-Liquid form. V2 also offers E-Liquids from the Zig-Zag brand which offers a total of 6 additional flavors to try including traditional, menthol, clove, mango, island breeze and dragonberry. All V2 branded E-Liquids are available in 25-ml ($16.95) and 50ml ($29.95) sizes with 5 strengths from 2.4% to 0%. The Zig-Zag brand E-Liquids are available in 60-ml with just 1.8% strength available. With either company, there are no combo or discount packages available, therefore, the E-Liquid method is quite a bit more expensive. Their Customer Service is one of the most comprehensive around. You can call them on their toll free number on their website or request for a call back. If you want to chat with a representative instead, you can opt for their Live Chat Support. Their current customer service hours are Monday – Friday: 10AM – 11PM EST. Saturday: 11AM – 5PM EST. Lastly, you can also email them with the listed email address found on their contact page.